so, i realize, i’m just not the best blogger ever. even when i’m on track with eating and exercising, i just don’t always find it ‘fun’ to update the blog. hopefully you guys understand that! i see that some people are still hanging around! last time i left you, i wasn’t doing too much, just living life. 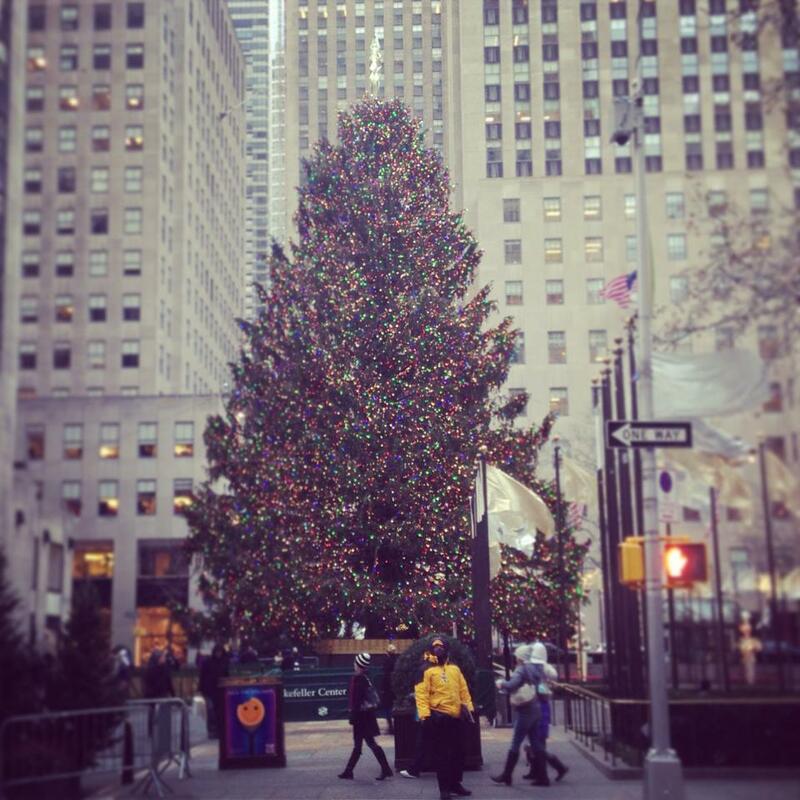 i did go to new york, which is CRAZY at christmas time. maybe a little too crazy for me, but i had fun regardless! other than that, i’ve been trying to eat fairly clean, with the occasional treats thrown in on the weekends. 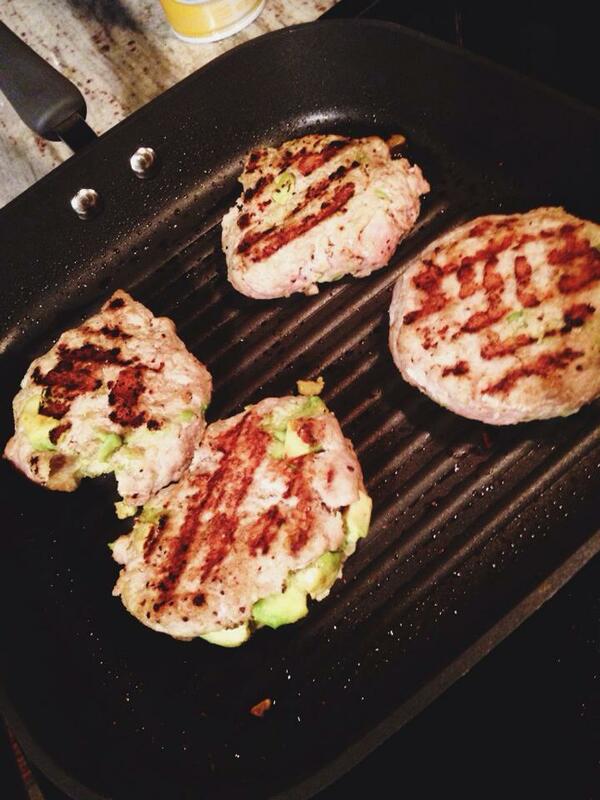 i’ve been loving a avocado chicken burger recipe i found on pinterest awhile back. these things are SO GOOD that they don’t even need a bun, which is saying a LOT coming from me! 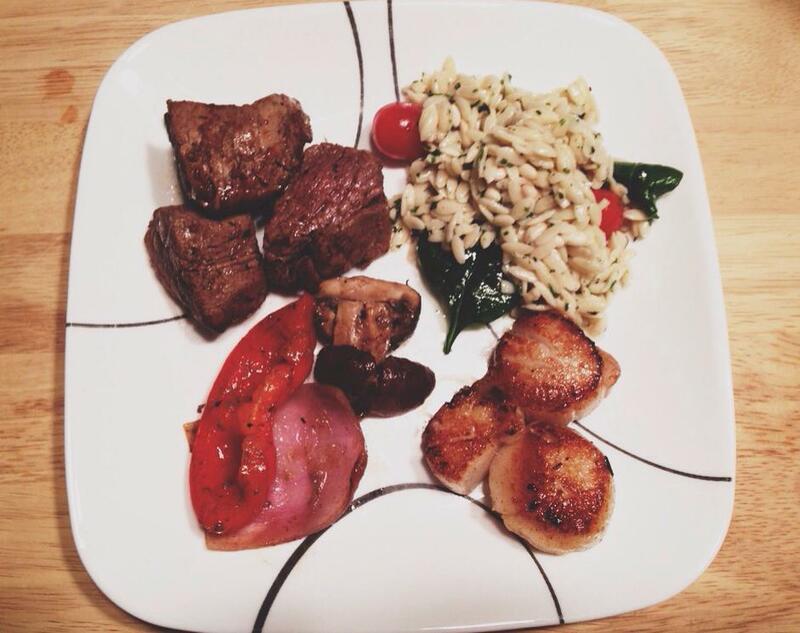 i also made some amazing filet and scallops for valentine’s day! i don’t love getting all into valentine’s day, because i think if you love someone, you should show them you love them all year long, but those are my thoughts, and i wont go any further into it! it’s been a CRAZY winter in richmond! i had all but given up hope that i’d ever see a decent snow fall again, but last week we got 10 inches at my house. plus, the temperature has been averaging around 10-15*, which is unheard of in these parts, so i’m dreaming of spring weather, and hope that it makes it here soon! and, i couldn’t not mention that someone turned 3 yesterday! yep, i can’t believe i got this guy a little less than three years ago! he has pushed my limits more times than i can count, but i wouldn’t trade this guy for anything in the world. i didn’t make him a pupcake this year, but he did get a few spoons of pb and almond butter! 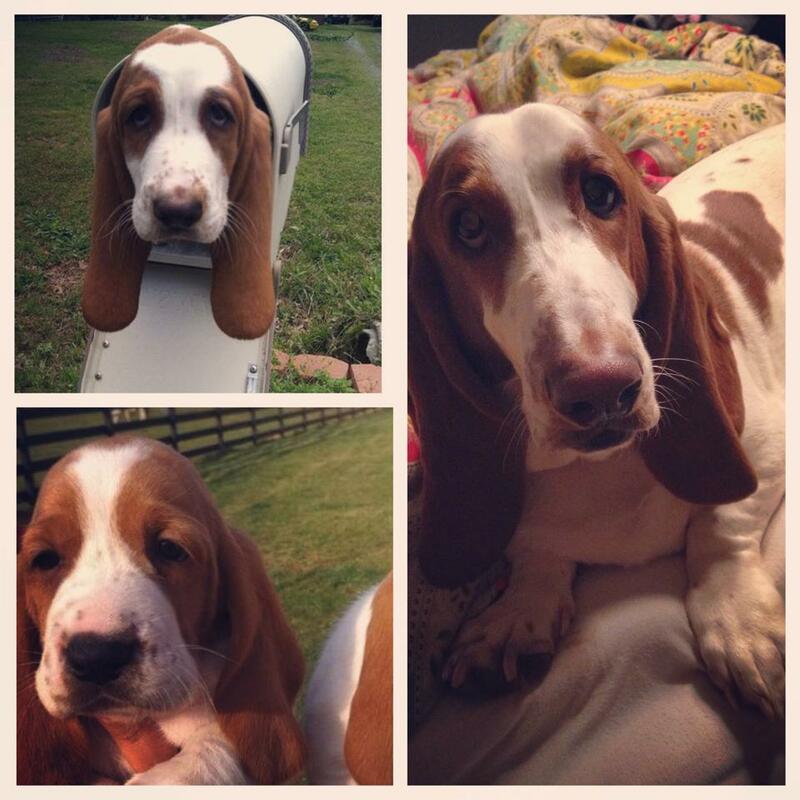 happy birthday, scout! as far as weight loss goes, i haven’t been restricting my diet and i’ve been at the same weight since the 24 day challenge. i know to some people, that may not sound great, but for me to actually maintain my weight, is something i’ve never been able to do. i’m either gaining or losing, so it feels nice to be in control, a little. i’ve also been going to the gym 3-5 times a week. i’ve been drinking this pre-workout and its helped me get motivated after a long day of work. its so easy to just go home, lay on the couch, and binge watch the following (SO GOOD), but if i drink the pre-workout before i leave work, there’s no way i’m going to waste the product/$$, so i end up in the gym and feel SO much better afterwards! plus, if i go home after the gym and mold into the couch, i don’t feel as bad! i got a phone call from my surgeons office yesterday morning and i’m scheduled for an appointment feb 28. i’m not exactly sure what will happen in this appointment, but surgery is not set in stone yet, because i still need to receive insurance approval. so, lets hope all goes well and i get approved quick! its been a longgg road, but i still know that in my heart, this is what i want for me and my body. i remember going on my first diet when i was 6 years old, so i’ve been struggling with this issue for 20 years. 20 YEARS. it’s so hard trying to convince someone this is the right thing for me. i’ve received many snide remarks from co-workers/others, like “i’d rather be fat” or “can’t you just eat less and not get the surgery?” not that these have ANY impact on my decision, BUT, its one of the main reasons i’ve kept my surgery to myself and the whole internet. again, i’ve asked before, but if you don’t have anything nice to say, don’t say anything at all, because i really don’t want any more negativity on this issue. so, i think that’s enough updating for you guys today! if you stuck around, thanks! and i promise i wont wait so long to post next time. i want to keep this thing going, i really do. i haven’t found a ton of blogs with the same issues as mine, so i’m hoping this can help other people.